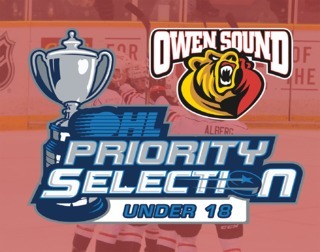 The Owen Sound Attack are facing elimination when the puck drops for Game 6 of their Western Conference Semifinal against the Sault Ste. Marie Greyhounds at the Harry Lumley Bayshore Community Centre on Sunday, Apr. 15. Defeated 4-1 at the Essar Centre on Friday, Apr. 13, the Attack now trail the series three games to two after dropping two straight to the Greyhounds. The Attack were sent to the Baywest Nissan Powerplay just 10 seconds into the game, and while they were unable to convert on their first special teams opportunity, it wasn’t long before they did find the back of the net. After drawing a penalty by forcing Jordan Sambrook to hook him while he was crossing into the offensive zone, Alan Lyszczarczyk gave the Attack a 1-0 at the 5:25 mark of the period on a pretty passing play that featured assists from Sean Durzi and Ethan Szypula. Lyszczarczyk’s goal, his 7th of the post season, saw him weave his way to the front of Matthew Vilallta and eventually tuck the puck through his five hole for the lead. The one goal lead lasted just under two minutes though, as Taylor Raddysh scored off of a faceoff in the Attack zone with 13:37 remaining in the opening period of play. 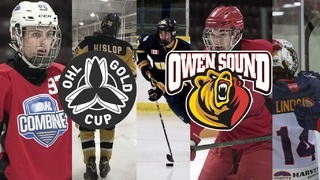 Owen Sound and Sault Ste. Marie remained tied at one until a rash of penalty trouble late in the frame put the Attack on their heels. After successfully killing off a 5-on-3 that saw Daylon Groulx and Kevin Hancock in the box, it was a high sticking minor to Chase Campbell that allowed the Greyhounds to get their first lead of the game. A five hole shot by Barrett Hayton beat Lafreniere with 3:28 left in the period sent the teams to the dressing room with Sault Ste. Marie up 2-1, despite Owen Sound holding an edge on the shot clock. When play resumed in the 2nd period, the teams were feeling shades of the 1st, with Morgan Frost taking another minor penalty in the opening minute of the period. And just like the 1st, Owen Sound was unable to score on the ensuing powerplay. The successful penalty kill by the Hounds gave them the momentum they needed to further increase their lead, and with 4:27 gone in the middle stanza, Rasmus Sandin sprung Hayton on a breakaway, and the Sault Ste. Marie sniper made no mistake, burying his 2nd straight goal to put the home team up 3-1. That goal chased Olivier Lafreniere from the net, with Attack Head Coach Todd Gill opting to bring on Mack Guzda in relief after Lafreniere allowed three goals on 15 shots. Guzda held the fort for the remainder for the period, stopping all five shots he faced, but his teammates were unable to provide him with any run support and an emotionally charged 2nd period came to an end with the team’s yapping at one another and the Greyhounds leading 3-1. The final frame of hockey consisted of more yapping and physical play, but the only difference on the scoreboard came when Morgan Frost scored into an empty net with 48 seconds left in the game to seal a 4-1 victory. Sault Ste. Marie swept the Mac Taylor Corporation 3 Stars, with Barrett Hayton, Boris Katchouk, and Taylor Raddysh earning 1st, 2nd, and 3rd stars respectively. The Mark McDade Chestnut Park Shots on Goal finished at 31-29 for the Soo on the evening. 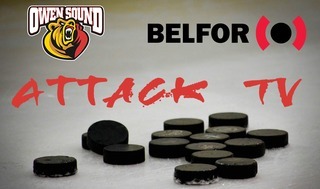 The Attack and Hounds will return to Owen Sound for Game 6 of the series on Sunday, Apr. 15 with puck drop at the Harry Lumley Bayshore Community Centre set for 7:00pm. 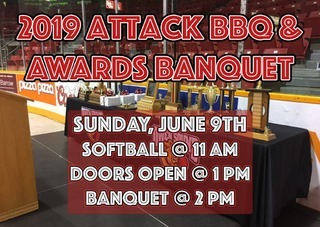 Tickets for the game are limited to standing room only and can be purchased at the MacVicar & McComb ReMax Attack Box Office beginning at 9:00am on Sunday morning. The Box Office will be CLOSED on Saturday, Apr. 14.